Limitless Pulse Pod System - Limitless Mod Co. This convenient vape pen kit is the newest edition to the Limitless Mod Co. line. 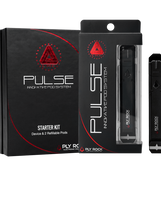 The Limitless Pulse Pod System comes with a vape pen, extra replacement pod and a USB charger. This unit has a capacity of 2ml and uses an 8 watt, 380 mAH internal, rechargeable battery.To turn the mod on, all you have to do is take an inhale from the mouth piece, there is even a button on the center that allows you to change the color of the LED light system.To access the fill port is extremely simple, all you have to do is remove the top mouth piece and rubber plug. This is a fantastic, travel friendly system that's great for vape enthusiasts on the go! Other Products by Limitless Mod Co.
LMC Redemption 80W Kit - Limitless Mod Co. Marquee 80W AIO Kit with Pod Adapter - Limitless Mod Co.
Verso Sub Ohm Tank - Limitless Mod Co. Marquee Replacement Coils (5 Pack) - Limitless Mod Co.
Hextron Replacement Coils (3 Pack) – Limitless Mod Co.
Pulse Replacement Pods (3 Pack) - Limitless Mod Co.
LMC RDTA Prime - Limitless Mod Co.
Limitless Pulse Pod System - Limitless Mod Co. has a rating of 5.0 stars based on 1 reviews.